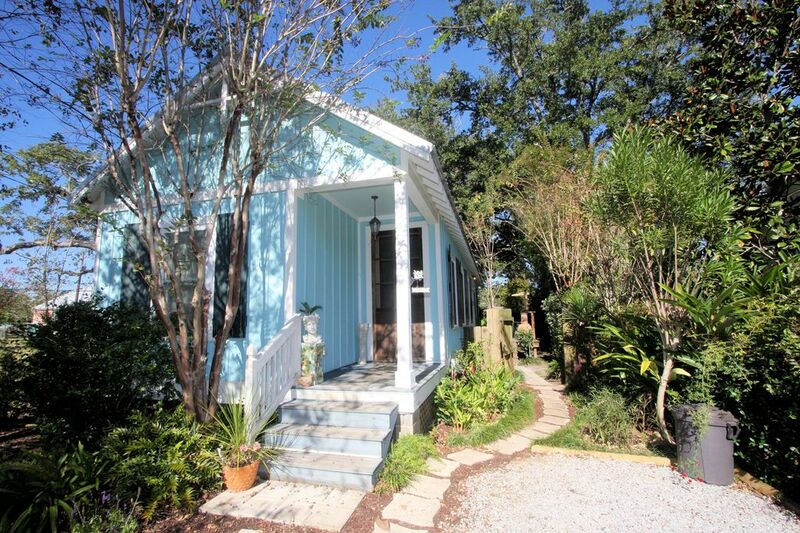 Big on charm is this 2 bedroom/ 2 bath cottage. One queen size bed and one full size bed. TV in living room and one of the bedrooms. Internet available. Outside Bar-B-Q grill available. Sits on a quiet street in the historic district of Bay St. Louis with large shade trees. Beautiful rear courtyard offers privacy and tranquility. Only one block from sandy beach, two blocks from public fishing pier. Close to restaurants and shopping. Managed by MANIERI REAL ESTATE, LLC. I am sorry but I am not the owner, I am the owner's property manager. I have been managing property for over 20 years, 6 of which have been with vacation rentals. I can say that managing vacation rentals has been an enjoyable experience for me since I enjoy meeting people and I get a get to watch other people enjoy what I have always enjoyed - Bay St. Louis, MS. This little cottage reflects the atmosphere of the Bay St. Louis I experienced when I was growing up. It has all the charm & quaintness of a creole cottage near the beach with shaded back yard from a huge live oak that is always lush and fresh. Homey atmosphere, with plenty of southern charm. Pleasant and relaxing environment, Short walk to sandy beach. Parking is limited to one compact car maybe 2. Great location. Short walk to the beach and drive to quaint shops. Most enjoyable was the claw foot soaking tub and beautiful backyard. I will definitely be back! This is a very cute artsy cottage. Very close to beach, perfect for those afternoon strolls at sunset. Close to town square and easy walking distance. We loved it so peaceful and to wake up in the morning to hearing the birds singing. Absolutely fantastic! The cottage is so cute! We will definitely be back! Everything was perfect! We had a great time staying at Boomas Cottage. We were about a block from the beautiful beach. So many fantastic shops and restaurants. The cottage was very well equipped. Super bright and colorful! Super cute and so much character!!! Boomas Cottage really felt like were staying in a piece of history. Everything we needed was there and it is a block and a half from the beach and a few blocks from all the dining and shopping of Old Town. This is the second property we stayed in that Joey Manieri was the property manager of. He’s the best. He responds immediately and the properties he manages are completely stocked with amenities. And he’s a Wikipedia of Bay St. Louis history too!! We’ve stayed in other places and none were managed as well. We highly recommend Boomas Cottage! This property is located in the Historic District near the Old Town area where there are various shops, restaurants and bars. From the Beach area of Old Town to the Depot are, you are within walking distance. If you do not want to walk, rent a bike or golf cart.